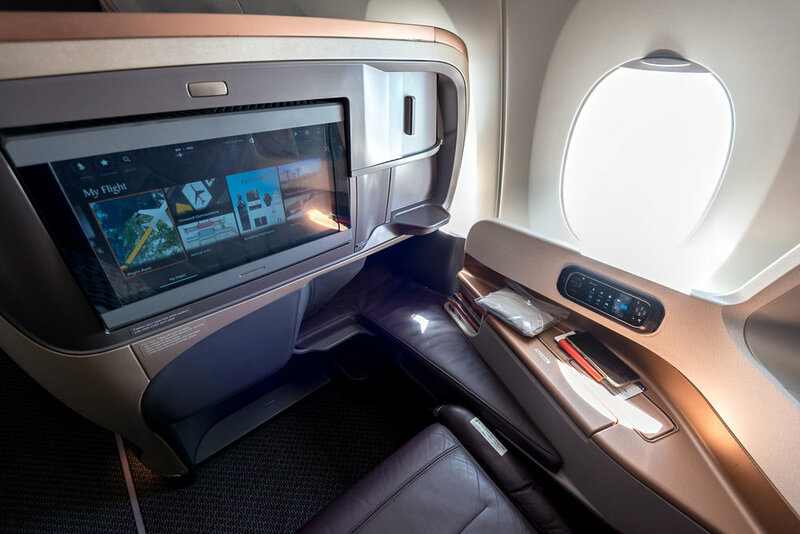 I visited Hong Kong earlier this month and took the opportunity to check out the Business Class product on Singapore Airlines' A350-900 - it was spectacular and I think it is probably my favourite Business Cabin product in the market right now! I arrived into Hong Kong International Airport at 2:16PM and since I was amongst the first to disembark the plane (there is no First Class cabin on Singapore Airlines' A350-900 product), I managed to get through immigration fairly quickly. Click HERE to check out my SQ856 flight from Singapore to Hong Kong! Once I have picked up my luggage (which was out first due to priority baggage handling - just one of the many perks you get with flying Business Class), I got out of the arrival hall to find a representative from Kerry Hotel, Hong Kong who then escorted me to the Limousine Lounge where my ride to the hotel was waiting for me. I only found out about the Kerry Hotel brand when I visited the Hotel Jen Beijing back in July 2017. For those of you who are equally unfamiliar with the brand, it is a relatively new brand by the Shangri-La Hotels & Resorts which focuses on comfortable luxury and every single property inculcates a sense of individuality. There are various ways to get from the Hong Kong International Airport to the hotel and even though I have previously arranged for a luxurious Tesla S to pick me up from the airport (which was awesome and I still utilised it during this trip), there is no better way to get to your hotel than a pre-arranged luxury hotel limousine. Priced at HKD 800 (SGD 140) each way, this is certainly not the most affordable option but if you are looking for a completely fuss-free way to get from the airport to the Kerry Hotel, Hong Kong, this has to be the best option. A BMW was sent to pick me up and complimentary WiFi is also provided in the limousine. Since I had my nifty little track to get roaming 4G for cheap, I didn't require it at all but this is definitely something that is valuable to travellers who have just stepped out of the airport and want to catch up on messages, emails or even the news. Located approximately 36km away, the journey from the Hong Kong International Airport to the Kerry Hotel, Hong Kong (which is located in Hung Hom) takes roughly 40 minutes without traffic. I was really eager to check out the property since it is designed by the world-renowned Hong Kong-born architect and interior designer, André Fu (who also designed The Fullerton Bay Hotel Singapore), whom I absolutely adore! One of the perks of taking the hotel-arranged limousine is that the hotel knows exactly when are you arriving and can therefore prepare for your arrival accordingly - if the room is ready, expect to be walked up to your room (or suite!) where a private check-in experience has been arranged. I stayed in one of the most highly sought-after club rooms here at the Kerry Hotel, Hong Kong - the Club Premier Sea View room. In fact, my room was conveniently located on the same level (Level 8) as The Club lounge (more on this amazing space later!) so I could access it easily without having to go to a different floor. Once you get in through the door, it opens up directly to space where an open wardrobe is located (there is definitely enough space here for a long-term stay) and the bathroom is located on the side. The very first thing you will definitely notice as you step into the room is the amazing view that it looks out to - this is definitely not the first time that I have stayed in a luxury hotel (check out my previous stay at The Ritz-Carlton, Hong Kong and the Grand Hyatt Hong Kong) that looks out to the iconic Victoria Harbour but seeing it from this angle and on such a low level (which is a great thing in this case) is truly quite awe-inspiring. The check-in process was fairly quick and my luggages were brought up to the room by the porter at the same time (nothing more annoying than having to wait for your luggage!). I was recognised as a Jade Member of the Golden Circle program during the check-in and was offered a late check-out (guests staying in club rooms here at the Kerry Hotel, Hong Kong are also offered a complimentary late check-out of 4:00PM if available) which I politely turned down since I had to be somewhere else on the day of checking-out. The Club Premier Sea View rooms are 60sqm in size and this is extremely generous in a city like Hong Kong where the land is scarce and rooms are typically quite small. Granted, the Hung Hom location where the hotel is located in is not exactly the most prime district but getting around is fairly easy since the MTR Station is located just a short stroll away from the property. There are two curtains here in the Club Premier Sea View Room - one for day and one for night - but unfortunately, they are not automated and you will still have to lower or raise them manually. 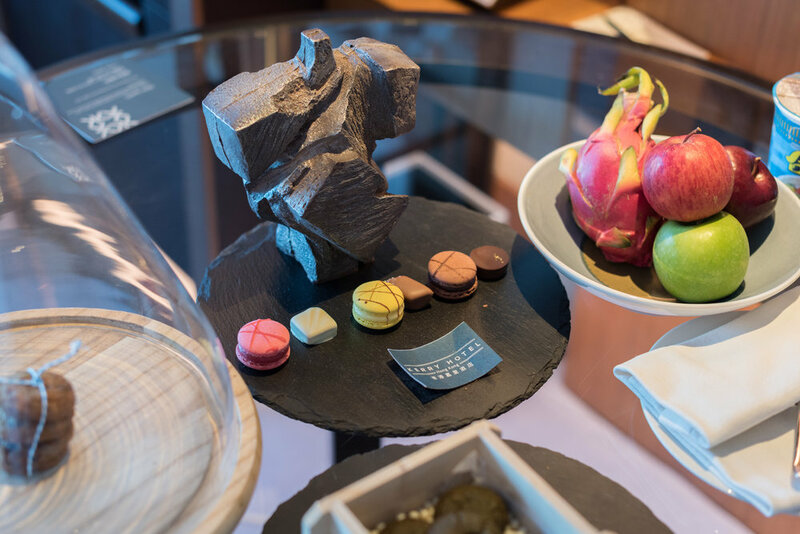 During my stay at the Kerry Hotel, Hong Kong, I also received one of the most elaborate displays of welcome amenities - a plate of macarons (including an impressive chocolate sculpture from the 'Tai Chi' series by Ju Ming), a small fruit platter and some cookies. As a Jade Member, I have also nominated cookies and milk (I got double cookies during this stay! ), instant noodles and chocolates as part of my welcome amenities for being an elite member in the Golden Circle program. I would imagine myself to be one of the rare few people in this world to get excited over these chocolate pralines - don't get me wrong, I am not at all a chocolate fan but this is the first time I am seeing the Golden Circle enso on the chocolates (and believe me when I say I have stayed at many properties under the Shangri-La Hotel & Resorts brand). There is also a comfortable and separate living and dining area (though not in a separate room) here in the Club Premier Sea View Room where I honestly spent most of my time in when I am not on the bed. 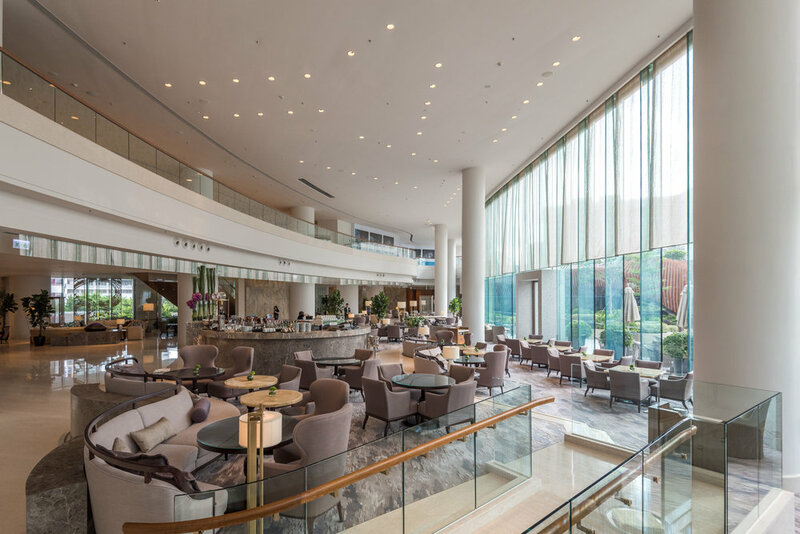 While I have previously thought that the view is probably going to be the most compelling reason to stay here at the Kerry Hotel, Hong Kong, I've quickly come to realise that the hotel itself is truly quite a piece of work in itself. Even though the bathroom of the Club Premier Sea View Room does not come with any natural lighting or a view, there is a deep-soaking tub at the end of the room, a separate shower area, double-sinks and a toilet here. There is also a small chair which is located under the sink which I used as a table for my laptop when I watched some shows on Netflix while being in the tub. The separate shower area in the Club Premier Sea View Room is also massive (probably a lot bigger than it should be) and it features both a handheld shower head as well as a more inspired rain-shower. Disposable amenities like toothbrush, shower cap and personal hygiene products are also provided here so there is really no need for you to pack your own toiletry bag at all. The bath amenities here at the Kerry Hotel, Hong Kong are in-house branded and they smell the same as the regular ones that I have gotten at Shangri-La Hotels. I personally believe that they are exactly the same which is a shame since this is a huge opportunity for the relatively-young brand to define and showcase itself as well. I am not sure if this is a temporary measure (since there are only three Kerry Hotels at this stage) or whether it is permanent but this is definitely an outlet that the brand should consider about developing. Complimentary evening cocktails and canapés are served at The Club (the hotel's equivalent of a club lounge or executive lounge) from 5:30PM to 7:30PM every night for club guests. The first thing you will definitely notice about The Club is a lack of dress code but don't get me wrong - I am not saying that there were people dressed in singlets or their bath robes here (and you should not be!) but there are no stuffy guidelines about wearing a collared-shirt or long dress pants here which are typically found in luxury hotels around the world. 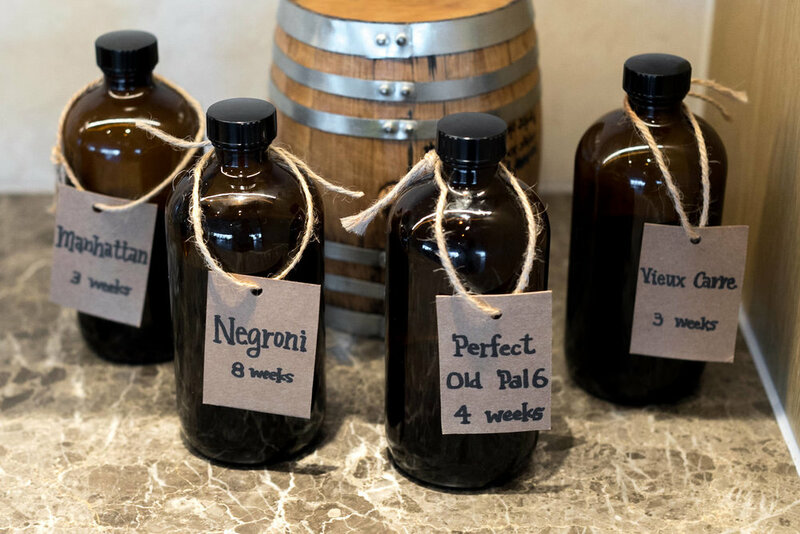 While this is really intended to facilitate guests to feel right at home at The Club, it is really up to every individual's own discretion to make this place a great one (which can sometimes be tricky!). One thing at The Club that really impressed me were these bottled aged cocktails that were displayed during the evening cocktail hours. Apart from a good selection of wines (I believe there were four on display) and spirits, club guests also got to enjoy these specially-aged cocktails as part of this two hour evening experience. I was initially a little confused about how do I actually go about 'mixing' them since there was a sign above that stated the ingredients of these cocktails but I quickly realised that these were ready-to-drink - just grab a glass, some ice and pour them out. It is worth noting that Champagne is not served here at The Club during evening cocktail hours. Apart from the amazing view (which I was blessed to have in my room), the food here at The Club was perhaps the most impressive element of the stay. 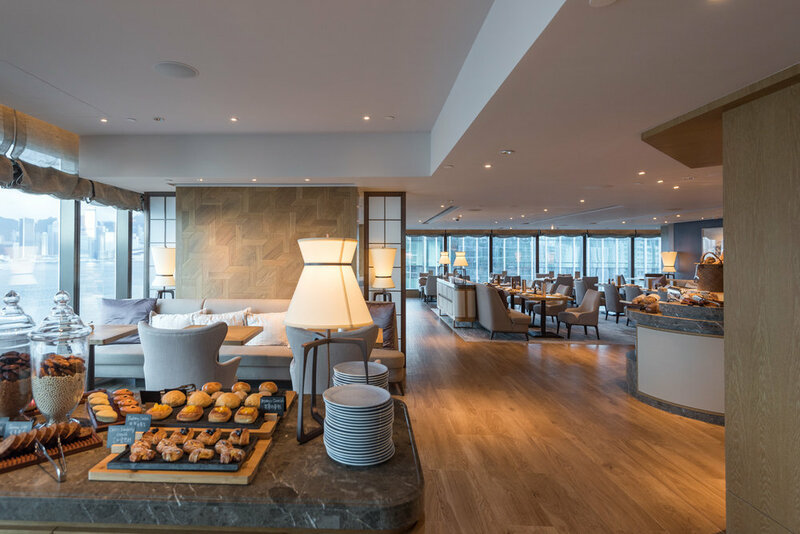 While it is not uncommon for club lounges to serve decent food during these two hours, I thought that the Kerry Hotel, Hong Kong has truly made an impression by offering bold and contemporary dishes (on top of more conservative choices). On the first night that I was there, a specially-prepared Wok Fried Frog Legs with Spices (also available in Hung Tong - a contemporary Chinese restaurant in the hotel) was served and it was amazing! I really have to applaud the hotel for taking such a bold stance and I thought it was also ingenious since it got to promote the Hung Tong restaurant which is located in the hotel as well. Most of the dishes served in the evening spread is also portioned and presented in a canapé-style. While this is great because you get to sample multiple dishes easily, it was difficult for you to have this as a light dinner (unless of course you were willing to shuffle between the buffet spread and your table multiple times). Most of the dishes that I tried during my stay were perfect and I was truly excited to check out The Club for breakfast (and afternoon tea!). I got back to my room after spending over two hours at The Club to find this amazing view from my bedroom. Since I was traveling with Nikon's first-ever fisheye zoom lens, the AF-S Fisheye NIKKOR 8-15mm f/3.5-4.5E ED, I decided that it was a great time to give this lens a go - the image has been cropped so you do not see the edges of the window but boy is this lens wide! I got up pretty early the next morning and decided to have my breakfast at The Club instead of the main restaurant downstairs. Like most hotels, club guests will have the option of having a smaller spread at the club lounge or a full buffet breakfast experience at the all-day dining restaurant. Since I got to The Club before 8:00AM, the place was almost empty and I took the opportunity to take some photos before the crowd got in. If you are looking for the best table in The Club, it is located on the far end of the lounge at the corner where a two-seater table awaits. In fact, the table offers a 270-degree view of the area and it is also semi-partitioned away by a wall so you are really getting quite a bit of privacy. I was also pleasantly surprised to find an extensive a la carte breakfast menu (which contains a number of luxe ingredients) sitting on the table. Coffee orders were quickly taken and I also went ahead to order myself a Lobster Eggs Benedict. Guests here at The Club are also invited to enjoy a specially-curated breakfast spread which consists of fresh bread, muesli, cereals, cheeses, fruits and a number of hot dishes. While I dare say that this is pretty typical of what you would expect to find in a five-star luxury hotel's club lounge, the a la carte menu is truly the star here. The a la carte menu (which you can order multiple items from) consists of buttermilk waffles as well as egg dishes like omelettes, eggs benedict, eggs florentine and eggs royale. Apart from those dishes, guests are also able to order more luxurious items like the lobster eggs benedict (which I have picked), the 63-degree slow-cooked organic egg and a grilled ciabatta with portobello mushroom fricassee and ricotta cheese. If you are a perpetually-hungry person, opt for one of the heavier dishes like the pan-fried grass-fed wild Herefords Australian minute steak, wanton noodle soup or the glazed fillet of cod fish. Seriously, the last place that I saw such an impressive a la carte breakfast menu was at the legendary St. Regis Bali Resort so imagine my excitement when I saw this here at Kerry Hotel, Hong Kong. The eggs on my lobster eggs benedict were poached perfectly and the toasted English muffin underneath it was absolutely perfect. Hearing that crack from the muffin while I cut into it was immensely satisfying. In fact, I was so impressed with the dish that I could not resist ordering another item from the menu (I seriously wanted to try them all!). The second item that I ordered was the 63-Degree Slow Cooked Organic Egg that was served with warm potato foam, shaved truffle, micro-greens and crispy Mangalitsa bacon. While it honestly did not look like much, it was really hearty and comforting to dig into. The slow-cooked organic egg was done perfectly (and it should be since it is the star of the dish) - it reminded me of Cumulus Inc. which I used to frequent in Melbourne. The potato foam. which is slightly less airy that I thought it would be, was also delicious and interesting. If you stay at the Kerry Hotel, Hong Kong and have access to The Club, I simply cannot see why would you pick an alternative breakfast experience. I highly recommend getting a room or a suite which gives you access to The Club at the Kerry Hotel, Hong Kong. If you are feeling peckish in the afternoon, head down here for an afternoon tea - they do have some delicious scones and sandwiches! Otherwise, if your room does not have a view of the Victoria Harbour or you simply want a little more space to unwind, head down (or up!) to The Club with your laptop or reading material and enjoy a. quiet afternoon away from the crowd in Hong Kong. The Kerry Hotel, Hong Kong is also home to one of the most impressive swimming pools. No doubt the pool was definitely slightly smaller than expected, being able to look out to the Victoria Harbour while working on a tan is amazing. I actually visited the hotel during the Summer and even though the city is currently facing one of the worst typhoons in recent years, it was surprisingly sunny when I visited a number of weeks back. The pool does get pretty crowded in the day so make sure you go down to the pool as early as you can if you want to take the perfect photo. I also found it a little strange that hotel guests were required to register and (digitally) sign on some form before being allowed into the pool area but hey at least they do not enforce the use of swimming caps here. I would like to think that the Kerry Hotel, Hong Kong is one of the best hotels in Hong Kong and even though it does not rival the likes of top-tier luxury hotels like The Ritz-Carlton, Hong Kong, it focuses a lot more on comfortable luxury. Most of us travellers do not live in a castle of grandeur and opulence back home (but hey correct me if I am wrong) and therefore, having a massive chandelier may not necessarily be the most "homely" element to a hotel. What the Kerry Hotel, Hong Kong has done well in my opinion, is not only to provide a beautiful environment but also to take care of your every need. Hung Hom is certainly not the first place in mind when you are thinking about prime hotel locations in Hong Kong but there is definitely potential here - hidden amongst the largely residential estate are just gems waiting for to be found. I simply cannot wait to head back to Hong Kong soon to check out what else Hung Hom has to offer in the year ahead. One of my travel highlights this year is traveling to Uluwatu in Bali - the flight from Singapore to Bali is easy and I highly recommend Singapore Airlines' Business Class product on the 787-10 Dreamliner. I have flown it multiple times and I really think that it is the best regional Business Class product out there. The American Express Platinum Concierge somehow managed to negotiate with the InterContinental Bali Resort on my behalf to convert the airport transfer (which was included in my room rate there) into a private transfer to Uluwatu for a fee. As such, it was not long before I arrived in Anantara Uluwatu Bali Resort for one of the most luxurious weekends that I have ever spent in Bali.